A giant iceberg twice the length of Beijing's "Bird's Nest" Stadium has been spotted floating off Australia and could be headed for New Zealand, scientists said on Thursday. The ice chunk, measuring some 700 metres (2,300 feet) long with an estimated depth of 350 metres, caused a stir when it was sighted by experts based on Australia's remote Macquarie Island. "I've never seen anything like it -- we looked out to the horizon and just saw this huge floating island of ice," said fur seal biologist Dean Miller. "It's rare to make a sighting like this -- it's certainly impressive-looking," Young told AFP. 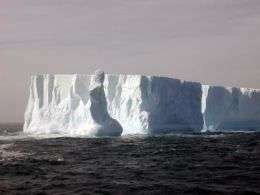 He said the iceberg had probably split from a major Antarctic ice shelf nine years ago, and said more could be expected in the area if global warming continues. "If the current trends in global warming were to continue I would anticipate seeing more icebergs and the large ice shelves breaking up," he added.